Diego Simeone does not believe finishing first or second in their Champions League group will necessarily be decisive for Atletico Madrid's chances of going far in the competition. Atletico lead Group A and will secure top spot if they win away to Club Brugge on Tuesday, having been dumped out of the competition in the group stage - and subsequently winning the Europa League - last term. Topping a Champions League group theoretically leads to an easier match in the first knockout round after Christmas but history shows this is not always the case for pool winners. 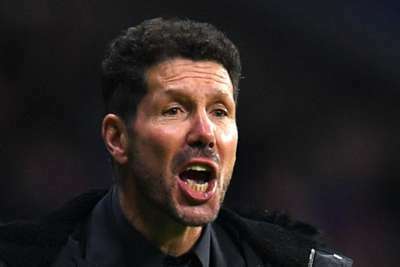 Manchester United, Tottenham, Roma and last season's beaten finalists Liverpool are among the teams who could place second in their respective groups, so Simeone is unconcerned about where Atletico finish in Group A. "First or second, nobody has a magic wand to know what can touch you or what can happen in the future," Simeone said at a news conference. "You have to go for the best, and the best is always to win. "They [Brugge] are a very competitive, well-organised team. Even though they've had a few negative results in their league, one month ago they were competing in the best way possible. "In attack they offer different variants, they have some players who are not going to participate or who are doubtful, but they have offensive power attacking inside and coming from the second line. "In the second half against Borussia Dortmund, they managed to counter-attack very well, and in the game that we played in the Wanda Metropolitano, after we got ahead, they showed danger when they were released to attack, so we hope to take the match where we can do damage." Simeone will have captain Diego Godin available, the defender having recovered from a thigh injury, while Jose Gimenez has also been passed fit to alleviate Atletico's defensive injury crisis. And the centre-back expects a tough encounter away to Brugge, even though the Belgian side are already guaranteed to finish third in Group A, heading into the Europa League as a result. "I feel good and recovered," Godin said. "In a season there are always injuries and it is a coincidence that several injuries have occurred together in defence. The team has responded. We do not go in thinking about the injuries. "It is a Champions League match and I do not expect a relaxed opponent. I wait for an intense rival, who competes well and as they did at the Wanda. We go out to win in each game and we look for victory as we always do. I expect the best from our rival."